W here is the ‘ghyao-tel pasal’?” Ask this question to any local of Kathmandu Valley and it’s a safe bet that he/she will know what you are talking about. Everybody, but everybody knows where ‘ghyao-tel pasal’ is. It, or rather, they (for there are half a dozen or so) are to be found behind the revered Annapurna Temple (Asonmaru Ajima) in Ason Bazaar. Ason is also where you will find the Annapurna Ajima (The Goddess of Abundance), the main temple on the precincts, at one corner. And close to this gilt roofed temple, you will find a row of small shops, about six or eight in number. All sell the same goods – ghee, oil, chaku (molass), candles, and…and… that’s it! That’s all these small shops sell. Not only that, that’s all they have been selling for the last hundred years or so… that’s right, about a hundred years! They have no individually identifying name. They are simply known as ‘ghyao-tel pasal,’ meaning ghee-oil shop. These shops are a few of the last remaining ‘heritage shops’ of the valley. How have they survived the remorseless passage of time and the havocs of change for well nigh a century? They are small, I have already mentioned that, but I am not really telling the truth. These shops are tiny. Tiny! Yet, legends abound of wealthy Newar families whose fortunes have been made through the business acumen of the so-called ‘Tel Sahus’ (oil merchants) and ‘Ghyao Sahus’ (ghee merchants). It is said that these ‘sahus,’ through the sweat of their brow and the business acumen managed to accumulate vast wealth by importing and selling just these two items in Kathmandu. And that, too, operating through these tiny, tiny, shops. Now, their great grandsons sit cross legged on small cushions in those very shops amidst ghyao, tel, chaku and candles. Why haven’t they expanded their range, or their premises, or, for that matter, their businesses? The first question is difficult to answer as is the last. In fact, candles were a more recent addition. “We started selling candles some 40 years ago. When the first hydroelectricity plant in Kulekhani was built, we thought that that was the end of the candle business,” says Pravin, owner of a shop at one far corner adjacent to the lane going to Mahabouddha near Bir Hospital. “But now we find that sales are much better than before!” So, at least there are some for whom load shedding is a blessing! It must be mentioned here that one of the most successful businesses in the Tuladhar community must be the famous Grand Wool Center in Kamalachi Lane of Ason bazaar. This is a pretty expansive shop and the first choice for any valley dweller when buying woolens. Unlike most of the other shops, Grand Wool Center has branches in Indrachowk and Sundhara. Apparently, all do roaring business all year round. All year round? How so? Who buys woolens in summer? Well, Nepalis living/working/studying abroad do. Remember how cold it was in South Africa during the World Cup this June? Besides, our friends abroad cannot come and go on a whim, so why not buy these dirt cheap (when compared to prices abroad), but excellent quality woolies when here? Coming back to ghyao-tel pasal, Pravin is 48 years old. His father, Prakash, is 68, and his grandfather, Moti Ratna, is 98. But, and I guess credit must be given to the purity of the ghyao-tel-chaku that they sell, for he is indeed a feisty 98-year-old. So says Sajiv Bajracharya of Shankha Pasal (literally, Conch Shop) that is located at the opposite end of the square on the road leading to Indrachowk. This shop, too, deserves the title of ‘heritage shop’ for it has also been conducting business as long as the above mentioned shops. In fact its owner, Sahadev’s father, Bhai Ratna Bajracharya, another old timer at 83, was the one to start the spice trade in Nepal. Not to mention the exclusive business of selling conches. But, we’ll come back to him a little later. First let’s see what Pravin has to say about what makes the ghyao-tel pasals so special. Now keeping this pessimistic thought aside, and before moving onto Shankha Pasal once again, let’s find out why these small shops have not expanded their premises, and, in fact, how they have managed to hang on (despite the tides of time that have seen old houses brought down to make place for new ones). Pravin says, “The thing is, we own our shops although they are a very small part of the big buildings in which they are located. The people on the floors above us own that part. You could compare this with the modern system of apartment ownership.” Well, that’s a simple enough explanation. And, what has continued for a hundred years should, presumably, continue for another hundred. But, that’s easier said than done. This is what Sanjay says, “Well, competition is tough now. And then there is the question of manpower and limitation of space.” He could well be the last of his family to continue with the business as could be the case with the other shops. And that would certainly be a pity, because then, where would his father, 78-year-old Asta Kazi Tuladhar, go to regain his ties with the good old days? “Yes, he comes here after five in the evening every day for old times’ sake to keep in touch with friends and acquaintances,” says Sanjay. As does Pabitra’s father, 62-year-old Sanga Ratna Tuladhar, who makes it a point to stay in his shop every Sunday. Bhai Ratna Bajracharya, on the other hand, has retired completely and does not come to his once famous shop anymore. He first started the business of spice 30 years ago, and his shop, ‘Shankha Pasal’ in Kothunani, Ason, still is a major dealer of condiments as well as dry fruit. Today, his son Sajiv looks after the business. The name of the shop literally means ‘Conch Shop’ and is so called because it also deals with another business that is quite exclusive: conches. In fact it is possible that their spice trade began after they had started the one in conches. 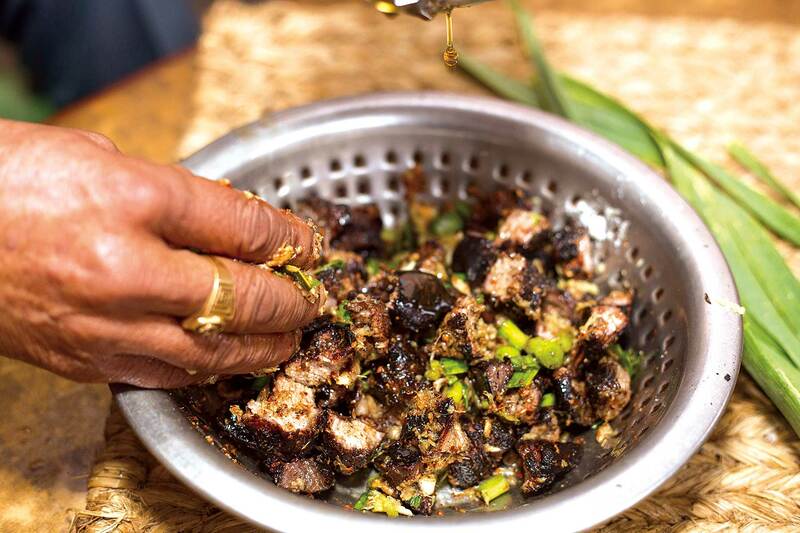 It could be that the conches were imported from the shores of south India, and since this region is famous for spices, the business of condiments followed as a natural adjunct. The word Ason is a derivative of the word Ansaa, which literally means ‘just there’ in the Newari language. Legend has it that during a heavy rainfall, a fish fell out of the sky at the place called Ason today. “Fish falling out of sky” – big news indeed! Naturally, everybody in the valley was asking each other, “Where did it fall, do you know?’ “Ansaa” was the common answer. In other words, “Just there.” And so, in time, the place came to be known as Ason. If you don’t believe me, go see for yourself the stone shrine built to mark the place where the fish landed at Ason once upon a time. They say that night doesn’t fall in New York and they also say that Mumbai never sleeps. Well, one certainly cannot say the same things for Kathmandu, but most definitely, from early dawn to late at night, Ason bazaar and its many streets are always thronged by crowds, many of them shoppers and as many people in transit from one point to another since Ason serves as a focal point to take short cuts to different parts of central Kathmandu. Early in the morning, too, you will find the bazaar vibrantly busy with people buying and selling fresh vegetables. Indeed, the best of the valley’s vegetable produce first comes to Ason and you can be assured of getting a wide variety at reasonable prices. The different kinds of fresh spinach are especially worth going to Ason for. The Annapurna Temple is, of course, the most revered shrine here. Nearby though, you will also see the smaller two-storey Ganesh Temple equally crowded with devotees. To the south is the Yita Chapal (southern pavilion), which was once used for festival dances. Near the centre of the square is a small Narayan shrine. Other temples in Ason are those dedicated to Shree Kumari, Uma-Maheshwor, and Chawoso Ajima. Ason Tole also has its own festivals, two of which are Asonchalan and Dye Lwakegu (Gods fighting). Ason also has numerous bahals (courtyards), two examples of which are Ason Baha and Dhalasikwa Baha. Up ahead, opposite the renowned Machhindra Bahal, is another heritage shop. This one deals with brass and copperware. As is the case with many of the old shops, it has no specific name. It is simply called, ‘Tama Pasal’ (Copper Shop). It, too, has gone through a couple of generations and is today run by the third generation of the family, Sanjay Baniya. Tama and pital gagris (copper and brass water vessels) are the most important items they sell, complemented by a wide variety of household utensils and items used for religious rituals. Just for the record, a tama gagri weighs around 3-4 kg and costs between 3,500 to 4,000 rupees. Similarly, a pital gagri weighs around 3 kg and costs from 1,500 to 1,600 rupees. Once upon a time, and not too long ago either, gagris were essential wedding gift items and it was not uncommon to see a couple receiving scores of gagris on their wedding day. But, times have changed, refrigerators and televisions are all the rage now, and nobody, I mean nobody, would be foolish enough to gift a gagri anymore! No wonder the once venerable ‘Tama Pasal’ looks a bit depleted nowadays. How long it will survive is anybody’s guess. He shows me a thick file full of well-thumbed lists. 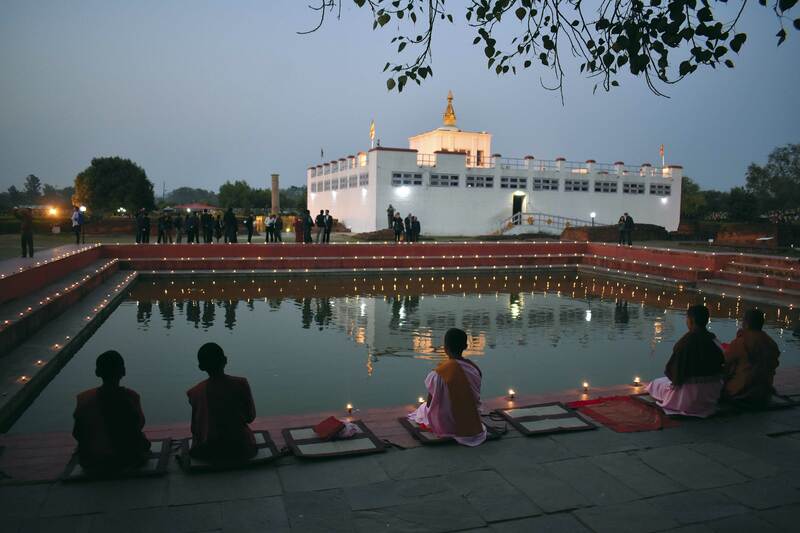 “There are different lists for Newars, for Parbates (hill folks) and for Buddhists,” he says. I can see that some of the lists are much longer than the others, while some are quite short. However, the longer ones predominate. He says, “I have to keep all the separate items in my shop. I tell you, it’s very difficult to manage all these items all the time.” But manage them he must. He cannot get away with any excuse, however justified. The lists are for things that are essential to the performing of rituals associated with birth, with puberty and adolescence, with marriage, with old age, with death, and with many other rituals in between. His numerous customers expect him to have all the items, no matter how rare or how small, in his shop. After all, his is the shop known commonly as ‘Janma Dekhin Mrityu Samma ko Pasal’ (‘Birth to Death Shop’)! According to him, shamans come to his shop to buy such things, which might also include bear’s hair, tiger’s whisker, and so on. I can just imagine Prakash at the Jawalakhel zoo trying to pluck a tiger’s whisker when nobody’s looking, or trying to pull out a black bear’s hair! The things one has to do to run a unique business! Jokes aside, the shop is open 24/7 to the rank and file of society, from the erstwhile royal family to the lay public. 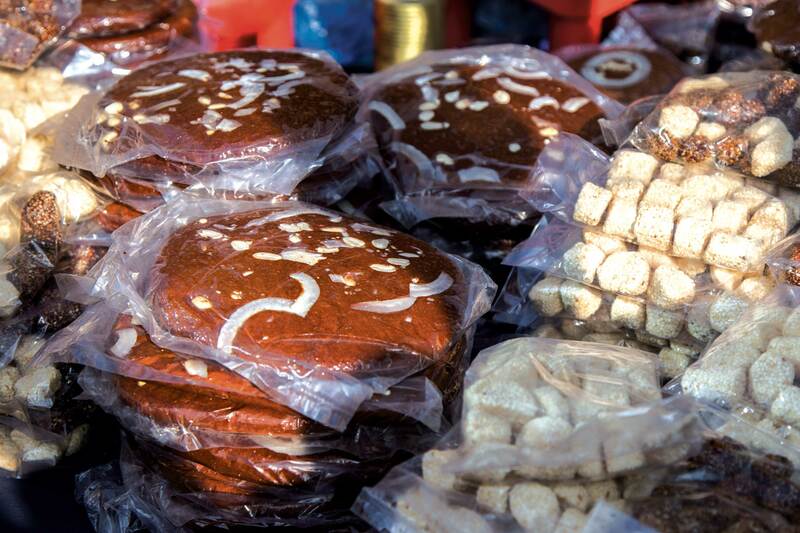 Talking of mithai pasals, these have always been the prerogative of the Rajkarnikars (another Newar clan). Besides the once reputed Ram Bhandar in Thapathali, you will find some of them (the really old ones) opposite Kastamandap Temple in Maru Tole near Hanuman Dhoka Square. They were once (and still are by locals) called ‘Maari Pasals’ (bread shops). Now, here, one must explain that when one says ‘maari’ one doesn’t mean just any one type of bread. Well, actually, there are a dozen or more varieties ranging from selroti, khajur, rodh, aanti, aainhthi, fini, Punjabi, puri, khasta, gajur, etc. So, now you know why a maari pasal is no ordinary pasal. Indeed, skillful expertise and recipes handed down through generations play a key role in their making. One of the oldest such shops was established by Purna Das Rajkarnikar in 1880. It is now called Purna Ashok Mithai Pasal. Right now, it is run by 50-year-old Yogendra, the fourth generation of the family whose lineage runs like this: Purna Das, Ashok Das, Dhir Das and Yogendra Das. Dhir Das is still around. He had had his ‘janku’ (second birthday at 77 years, 7 months, 7 days) a few years ago, and so is around 80 now. Like other heritage shops, the maari pasals, too, have huge reputations to live up to. And, judging by their popularity and the high esteem with which locals regard them, one must conclude that the tradition of purity, honesty and dependability continues to be the norm. An interesting aside: as I was talking to a salesman here, a young chap came into the shop and placed an order for a kilo of waasa: (sutkeri masala in Nepali). Anticipating my interest, the salesman explained to me, “Yes, we also make waasa; it is part of the post partum diet for new mothers. It costs Rs.1,000 per kilo.” Apparently, waasa is a highly nutritious mix of gund (edible gum), dry fruits, batisa (mixture of 32 herbs), jwano (thyme), methi (fenugreek) and sounf (dill). It is considered a potent concoction, taken dissolved in milk or water, and is said to impart almost all the essential nutrients in concentrated amounts. There is another interesting shop opposite Kasthamandap Temple. According to Raju Shrestha who has an ayurvedic shop close to the temple, it is called the ‘Dhyaku Pasal’. Dhyaku? What’s that? Now, before you start making wild guesses, let me tell you that it means “corner.” So, ‘Corner Shop,’ get it? This shop, dealing in Ayurvedic products, was established a long, long, time ago by Gyan Man Baniya and is today run by one of his progenies, Ram Man Baniya. In conclusion, it has to be said that the old pasals (shops) in Kathmandu are an endangered lot and, except for a few, it is doubtful whether they will be around for much longer. This is so because these shops are actually not individually as significant as the bazaars and toles that they are located in. The dismal record of heritage conservation here is well known and apparent to anybody who takes a stroll through these historical areas. At the rate in which old buildings are giving way to new dwellings, the rate at which competition is growing and the mass exodus of the younger generation for more rewarding pastures abroad, it is a given that these tiny shops will soon have to face the fact that there cannot always be ‘business as usual’ as it has been for over a hundred years.